Developed as a high-strength cleaner for floor prep after adhesive removal, Sentinel 810 All-Surface Floor Cleaner also works great for floor cleaning. SENTINEL 810 All-Surface Floor Cleaner is great for floor prep and everyday cleaning and maintenance. 810 is designed to safely clean and shine finished hardwoods, laminates, ceramic, stone and vinyl. 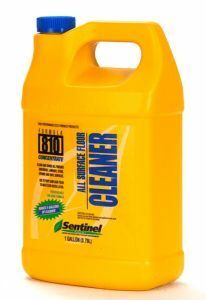 Sentinel’s 810 formula will clean grease, oil, and dirt residue then quickly evaporate leaving a shiny surface. Sweep, dust, or vacuum floor to remove loose dirt and grime before using 810. Use warm water to dampen sponge, mop, floor bonnet or Sentinel’s All-Surface Microfiber Pad. Spray 810 directly onto the surface and wipe clean. Spray or pour Sentinel 810 onto subfloor. Agitate with a broom, mop, or sponge and remove adhesive residue. Rinse area thoroughly with water and allow surface to dry completely before applying new flooring. 810 is not recommended for unfinished wood floors or floors finished with oil or wax. Oversaturation or forming of puddles for an extended period of time may cause staining.